As a society, we have developed certain standards. Over years of conditioning, those standards have included the belief that those with disabilities are below others. This means many people are hesitant when it comes to dating someone in a wheelchair. This is a ridiculous line of thinking, but it takes time to undo that kind of misconception. Each and every one of us can take a step a day in helping change the view of others. In the meantime, there are some harsh realities regarding the romance adventures. It doesn’t matter on gender – a person using a mobility device may feel insecure. Because they are used to stares and side comments, they are likely to ignore them while you’re out together. This is a coping mechanism and far better than arguing strangers. If you’re insecure about dating someone in a wheelchair, don’t bother. If you’re a strong and self-assured individual, there are ways you can cope with the commentary. You can comment in response. Let the people around you know that you’re happy to be in your dates company. Let them know that your date is a strong and compassionate person who is more than the chair they are confined to. If you don’t want to confront unimportant people – that’s fine. But show your date the sentiments above. This is about letting your date know that you are comfortable with the way they are. That’s all that really matters to them. There are extra responsibilities – but you can handle it. When it comes to making the dating arrangements, it’s not as easy as just going out. Unlike with able-bodied dates, you’ll have to consider accessibility when it comes to planning. There are going to be some places that are off limits because they aren’t accessible. There are going to be others that are gold mines for dating someone in a wheelchair. There are more and more venues becoming accessible. If you don’t know where to go, you can always ask your date. There’s a good chance your date knows the best places to go. These extra responsibilities are nothing more than consideration. There is nothing worse than assumptions – so avoid making them! 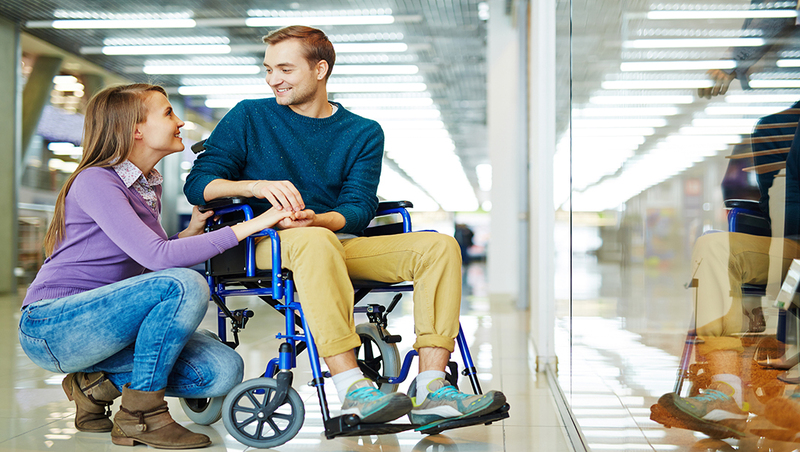 Many people using mobility devices have shared their dating experiences online. These experiences range from ridiculous to awe-worthy. One of the most common complaints is people make assumptions about dating someone in a wheelchair. Whether it’s helping them sit down at a restaurant or pushing their wheelchair without permission, it’s a pain in the neck. If your date wants your help, they will ask for it. You should never assume that help is needed. It will only make your date feel like codependent. Instead, try offering your help in a friendly manner. You want to avoid saying something like “you look like you’re struggling”. Instead, you might offer them help by saying “I’m happy to grab that for you.” If you offer your help, make sure your date knows that you are happy to help them. Forget about the misconceptions – get to know more than the chair. Just because your date isn’t as mobile as you are doesn’t mean they aren’t amazing. You may have questions or concerns about your future together and how the chair is going to fit into those ideals. There is often a concern about adult relations and starting a family when you’re dating someone in a wheelchair. But each wheelchair user has a different circumstance. Each one has a different level of mobility. You can’t generalize their situations. Instead, get to know your date and what makes them uniquely them. You’ll find it worth your your time!